It might come as a surprise to some people that there is not only a sequel to Jarhead, but also two of them. The 2005 film about a group of marines that desperately wish they could see action but instead are greeted with the banalities of life in a war zone, whose entire point was that maybe you don’t want to see action as much as you think. Maybe you don’t want to kill people. So of course they decide to make a direct to DVD set of sequels that are dumb, pointless action movies all about killing as many terrorists as possible. You have to love franchises. This film, much like its predecessor, bears no resemblance to the original title. There are no characters to relate to, no talented actors, and I’m not quite convinced that they actually used a script while filming. I knew I had to watch them, and I found a certain amount of pleasure in the second one. Unnecessarily gory kills and a thin premise at least gave you something to laugh about with friends, coupled with the fact that it’s a sequel to Jarhead, makes a dumb action movie that you can almost appreciate. Unfortunately, that is not the case with this movie. 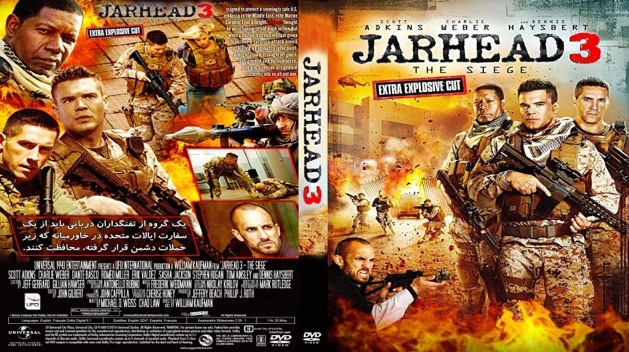 To put it simply, Jarhead 3: The Siege is a bad movie. To call it awful would be a disservice, because then it would imply that it at least excelled at being bad. Instead, it was utterly forgettable in every way, where the throwaway villain had more charisma than the rest of the cast combined, and if you asked me about the name of the main character during the credits, I already would have forgotten. Our main character is a square jawed cliché of an action hero. Tough, no nonsense, and utterly of the belief that he can get everything done by himself. Alongside him you have a contingent of marines stationed at a US consulate that is attacked by terrorists in such an obvious play on the whole Benghazi fiasco. It’s 13 Hours little brother that no one likes to talk about. Like Trey Smith, Jaden and Willow’s sibling that everyone always forgets about. Our cast of clichés has to fight out a siege by nameless terrorists that are evil for the sake of being evil; all while our main character learns a lesson about the values of teamwork. The movie ends in the basement of a “Freedom Burger” where our surviving members of the cast take their final stand, blowing the bad guy to smithereens while he wears what can only be described as “a fourteen year old’s idea of a look of ridiculous shock.” This is possibly the best part of the movie. By far. There are no redeemable qualities about this movie. It’s rare that I actually say that about a film, but this one stands out as being so middling that no one should ever watch it. Watch literally anything else instead. Like Jarhead 2: Field of Fire, where you can watch a man get hit by a grenade and turn into what looks like pulled pork. It’s fantastic.